Standing tall and proud, looking down the hill on its village, Warkworth Castle in Northumberland is a thing of beauty. 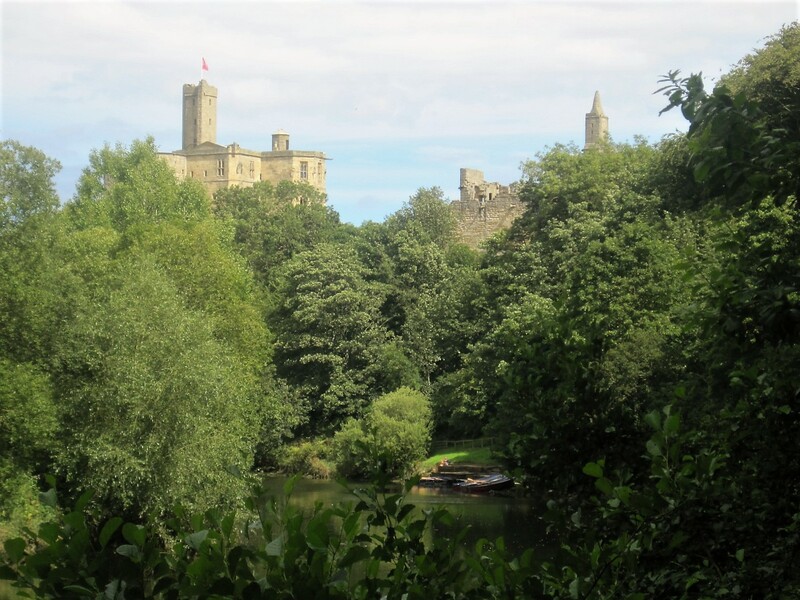 Romantically situated on a loop of the River Coquet, Warkworth has a lovely riverside walk, with a surprise in store. The perfect setting for an anniversary weekend. Too long since we’d visited the combination of castles and beaches that tell this county’s story, though it’s only an hour and a half drive from home. 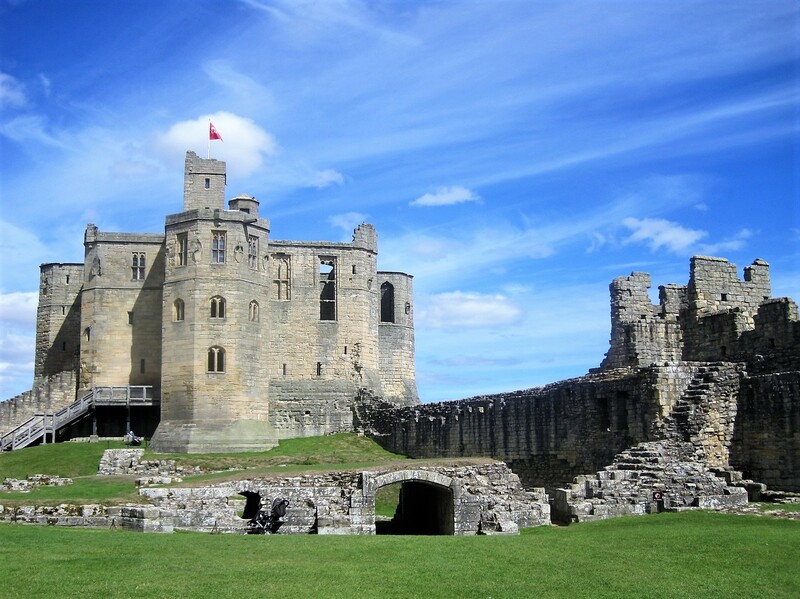 Grand though it is, the castle at Warkworth has indeterminate beginnings. A settlement existed here right back to 8th century, but the motte and bailey (an artificial mound surrounded by a fortified enclosure) and first stone buildings are generally credited to Henry, son of King David 1st of Scotland, after he became Earl of Northumberland in 1139. The castle is first documented in a charter between 1157 and 1164, when it was granted by English king Henry II to Roger fitz Richard. It is entirely possible that this Henry was responsible for the castle being built, one of a number intended to secure his position in the north. In any case, the mighty keep was not added till around 1400. The lengthy story of the Percy family and their influence in this area can be read on the link above. The tower is in the shape of a Greek cross, the four wings arranged over three storeys around a central light well. Stepping inside, the building appears solid and sombre, the ground floor being used largely for storage and service. Glancing at the floor plan, I bypassed the mighty chimney place, drawn to the lovely views beyond the window. The coast is just a mile away, along the sinuous curve of the river. The first floor comprised kitchen, buttery, great hall, great chamber and chapel. The chapel had an upper level where the earl could worship in private. The varying size and ornamentation of the windows indicate the importance of the rooms they light. Prominent within the grounds, the Lion Tower, with flamboyant heraldry, once gave access to a further grand residence. The Curtain Wall surrounding the bailey and the Carrickfergus Tower date from 13th century. My guide book had given details of a circular walk, taking in riverside and beach. It also mentioned a hermitage. The path drops invitingly down to an idyllic riverside setting. Looking back, the castle, sitting atop the trees. All that was needed was fair maiden and a knight in shining armour. We followed the path until it opened out. And then, the strangest thing! Across the river there was just visible a building, built into the rock face. With a splash of oars, a friendly face appeared. The ferryman, all set to row us across the 40 foot span of river. How strange to hire your very own hermit to say a prayer for you. The Percy family had wealth aplenty to do so. It gave me goosebumps. I was glad to see the smiling ferryman, with his next cargo. Back over the river a track headed uphill, in what we hoped was the direction of the coast. I was happy to see the sea across a cornfield, and do a little spying over fences, as the trail led us back to the village. The door of St. Lawrence’s Church was a wide open invitation for a few moments serenity, sunlight streaming through the stained glass windows. The heart of the village is small and pleasingly intimate. Weathered stone and tubs of riotous colour a happy blend, encircled by the ever present river. A gateway heralds the 14th century fortified bridge, beyond which a narrow lane leads to the beach. Families trek to and fro in the still, warm air, the lighthouse on Coquet Island just visible across the expanse of sea from the river mouth. At my feet, a mingle of unfamiliar shells and pebbles. The beach is emptying as we walk along, clouds gathering. A few hundred yards ahead we find the path that leads up through the dunes and beside a golf course. The sign on the bell dangling beneath the bridge makes me smile, the evidence of danger visible as a golfer hunts in the rough. Our adventure is almost over now, as we rejoin the path back to the village and, much later, a well deserved reward. I know that Paula won’t have time to read all of this, but it does fit rather nicely with her Traces of the Past. 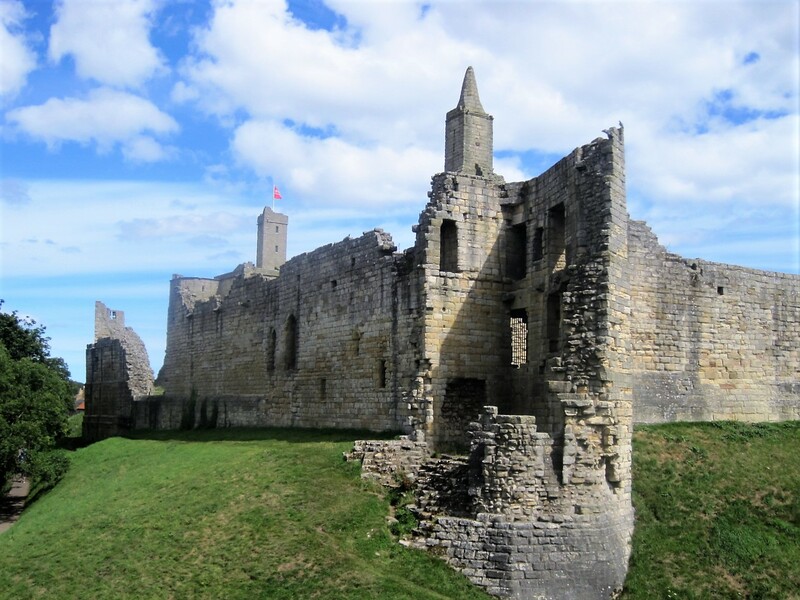 Go and linger by the water with her, then follow the link to the English Heritage site for more of the fascinating history, and details of how to get to Warkworth. A joint ticket can be purchased for the Castle and Hermitage. My next two walks will continue to feature Northumberland castles, but I hope you won’t be bored. Many thanks to all of you who labour so patiently beside me. I just wish I could share the cake! Never mind, it’s kettle on time. There are walks to share. Join me any time here on Jo’s Monday walk. Excited to start us off with Debbie and a place I visited and loved, many years ago! Swedish platter, anyone? You never know what you’re going to get with Jackie! I made it! Glad you could keep up with me. See you all next week? Wishing you a good one! 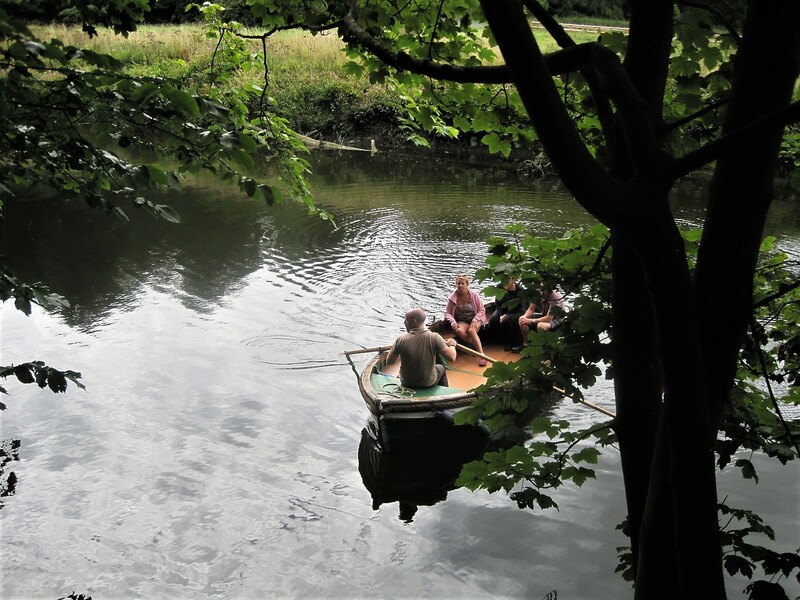 Hi Jo, what a lovely post, and what a weird but helpful experience with the hermit ferryman! I can imagine you feeling reassured when you got to the other side, and also when you saw other passengers being conveyed by him. Thanks for welcoming me back after my summer absence. One of the reasons was that in the space of a month I lost an aunt and then my mother, so two funerals and travels back to the UK with all that goes with them was draining, as you know yourself of course. But I also had a couple of vacations too, so all was not gloom. And sometimes it’s good to give even something you enjoy doing, a bit of a break. Best wishes as always. I do enjoy your Monday Walks. Sorry about your Mum and aunt, Denzil. Awful experiences and you need time to get over them. I’m about to step away from my blog for a little while too. The move to Portugal is imminent and things are happening. I’ll try to stay in touch, but life doesn’t offer many guarantees, does it? Not a problem, Eunice. I was up at 5.30 so we almost ‘crossed over’. 🙂 🙂 Sometimes I lie with a head full of worries and it’s easier just to get up. You could always just link to the post after it’s up, but you should work it to suit yourself. It was a magical weekend, Rosemay, even though the weather disintegrated entirely the next day. 🙂 🙂 I’m just about to write the next ‘chapter’. So nice talking to you, and thanks for all the time you’ve spent here. Sending hugs! You certainly had a good day for it. The castle images juxtaposed against that blue sky were just magnificent. And I am glad it was a ride with a happy ferryman rather than one wearing a dark hoodie and carrying a sickle. Wishing you many more such lovely days (and a few slices of cake like that for me).